Aspergers is an autism spectrum disorder, that in the latest DSM V handbook has gone away as an official diagnosis, but can be considered a less severe form of autism (for lack of a better term). Although to those of us parents living through it, I don’t know that I would call it less severe, I would just say that it has its own unique challenges that other forms of autism do not always have. I may not walk in the shoes of a parent who has a non-verbal child, but I don’t know how many people would want to walk in my shoes either. Yes I think my daughter is amazing, but at times she can be the most frustrating human being on the planet. 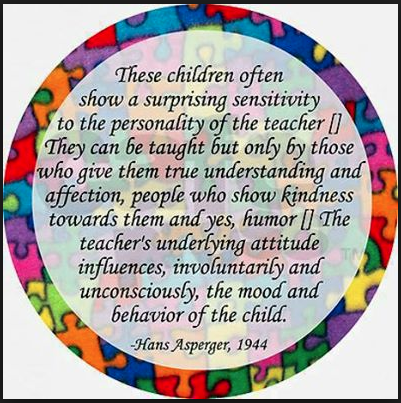 Although Aspergers was not officially recognized as an autism spectrum disorder until the 90’s, it was originally discovered in 1944, by Austrian Paediatrician Hans Asperger. Today we are not going to talk about the causes of Aspergers, or the challenges those of us face, today we will honour International Aspergers Day and have a little fun. I’m like square peg tryna fit a round hole. And my congeniality map is malformed. With great effort I struggle to discover abilities that come as second nature to others. Communication is laden with unwritten rules and for their discernment I was gifted with insufficient tools. The goal of developing people skills couldn’t possibly have been made into a steeper hill. My social sensibilities are short circuited so it seems I’m destined to be misinterpreted. But I only got one brain so instead of throwin my hands up and cursin it I try to work with it. My interests all lie upon a narrow field and very few people are subject their appeal. The understanding of others seems unattainable and sharing my own interests makes me unrelatable. I tend to perseverate on a few topics like comic characters and Jazz soloists nuances. Like how the West End Blues trumpet solo follows the same pattern that the opening cadenza models. Or how the same image is on the first and last pages of every single chapter in the Watchmen graphic novel. I start talking you’ll wanna pull out fast. It’s like I’m destined to play the role of an outcast. As far as close friends I don’t have a long list. Solitude is who I spend most of my time with. We currently retain a strong involvement because she’s the only one I get along with. I’ve noticed other people tend to avoid her but ever since our first encounter I have enjoyed her. As long as I live she will always remain a constant companion and a pleasure to reconnoiter. Is he ok? Why won’t he play? So thank you Dr. Hans Asperger for making your discoveries, and we only wish you could be around to see the amazing discoveries, research and evolution of Aspergers in today’s society. Check out this awesome blog!